Short N Sweet, home of the rare dwarf cat breed the Munchkin, sometimes referred to as the "dachshund of the cat world" . Short-N-Sweet Cattery is located in Mackay, QLD Australia. I'm a registered breeders with ANCATS. I first fell in love with this breed in 2007 and have only now had the opportunity to become involved in the future of this wonderful cat. My goal is to breed healthy, happy kittens to standard. With the munchkin breed in every Litter you can get standard short legs and the non-standard long legs born. I will be focusing on producing chocolates, dilutes, silver and mink in varying patterns including colourpoint and bicolours. I aim to provide quality kittens whom will give a lifetime of joy and happiness to their owners. Please feel free to contact us if you have any questions or would like to join our waiting list. 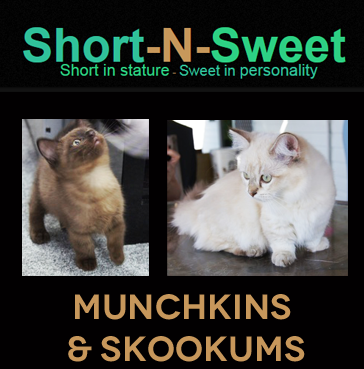 We also have a facebook page Short-N-Sweet munchkins and welcome everyone to join, to get your regular pic fix. SKOOKUMS - We are about to start breeding skookums - more on that soon!